This Electronic Press Kit (EPK ) was distributed as a promotional item for Bryan Ferry's Mamouna album. 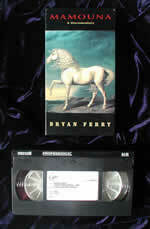 The video had interviews with Bryan Ferry, producer Robin Trower, guitarist David Williams and drummer Steve Ferrone. The video contained rare studio footage of Bryan at the piano doing a piano/vocal version of both The Only Face & Mamouna.The promotional video for Your Painted Smile was included on the video.